White Lies, gig in Leeds. After three consecutive top five albums, White Lies have announce that they have finished work on their latest and will release their fourth album ‘Friends’ on October 7, followed by a big tour. 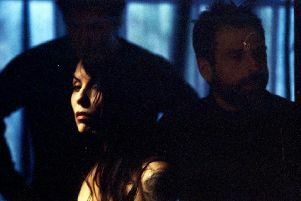 The first release under a new deal with BMG, ‘Friends’ follows their number one debut album ‘To Lose My Life’ (2009) as well as ‘Ritual’ (number three, 2011) and ‘Big TV’ (number four, 2013). With ‘Friends’, White Lies haven’t so much abandoned their trademark synth-rock sound as given it a spring clean by exploring new sounds. For many reasons, it felt like a fresh start. The trio were temporarily without a label after a bout of record company reorganisation. Rather than re-sign straight away, they decided to start ‘Friends’ under their own steam without the pressure of a deadline or a budget, or even the guidance of a producer. Whatever sound each song suggested, White Lies went with it. Hence, when ‘Hold Back Your Love’ and ‘Is My Love Enough’ sparkled with disco grooves, they embraced it. When the ballad ‘Don’t Fall’ jettisoned their signature sound entirely, leaving only frontman Harry McVeigh’s sumptuous vocals to connect it to White Lies of old, they stuck with it. Similarly, when ‘Summer Didn’t Change A Thing’ harked back to the arena-ready rock of their debut, they didn’t mind. The 10-track album will be released on CD, vinyl, picture disc, digital download and streaming formats, as well as a special box set edition which will include a cassette and four exclusive bonus tracks. Pre-orders are now open at all retailers including White Lies’ official store, iTunes and Amazon where ‘Take It Out On Me’ is available as an immediate download. White Lies have also announced details of an extensive UK and European tour which stretches from late September through to the start of December. It includes a date in Leeds when they will appear at the Stylus venue in Leeds on Wednesday, November 30.